Putting out fresh, relevant content is more than a good idea for companies — today, it’s a vital step in achieving business success. Through content, you can engage prospects and customers, boost search results for your website, enhance branding, and more. So how do you get started? It all begins with building a content calendar that is based on your overall content strategy. Here’s a look at how to map your content to the sales cycle — for both current and prospective customers — and use this information to create a strategic content calendar. The first step in creating your content calendar is to understand the phases of your company’s sales cycle. Say you’re a commercial cleaning company. Ask yourself how people become your customers. Do they find you through pay-per-click ads on search pages? Television advertising? Word-of-mouth referrals from other clients? Talk to your salespeople and find out what your typical lead-to-conversion cycle looks like. Say it’s typically online marketing from your sales team, followed by an in-person meeting with interested parties, and then personalized sales packets that propose custom cleaning plans. You’d want to identify key demographics in the timeline, such as new leads (the people seeing your online ads), interested prospects (the people who contact you for more info), new customers, returning customers, former customers, etc. These will be the categories to which you allocate topics. Take time to learn as much about these different areas as you can. If your new leads come primarily through online ads, spend time finding out about the prospects who respond to them. Once you’ve gathered data on these groups of clients, you’re ready to start planning the content you will target them with. You’ll devise lists like these for each stage of the sales cycle. Once you have exhausted all your ideas, you can move to step three. After you’ve taken the three steps outlined above, start putting your content into place. Write the articles, make the videos, schedule the ad campaigns, and so on. Monitor the results of your efforts, and continually refine and adjust the type and schedule of content accordingly. For example, if you see prospects are responding especially well to your eNewsletter but less to your pay-per-click ads, focus more attention on newsletter content. 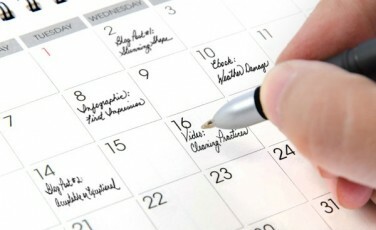 What are your thoughts on content strategy and scheduling? Have you been putting off creating a content calendar for your business because of a lack of understanding, lack of know-how, or other roadblocks? If so, it’s time to do something about it. By using the simple steps outlined above, it’s easy to put a plan into place. Shanna Mallon is a writer for Straight North, an Internet marketing agency headquartered in Chicago. She’s been writing professionally since 2004. Follow Shanna on Twitter @foodloves, and follow Straight North on Twitter and Facebook.